It's beautiful. Wow. I would love to go inside and see what colors are there as well. It reminded me of things made from lego blocks. Lots of nice color for your theme. Now that is a colourful house, a very nice find. What a happy looking pillars to welcome the visitors. I would paint like this if I have pillars at my house too. Colorful photo ~ didn't know about colors being related to religion ~ thanks, namaste. No one will miss this house. So colourful and so striking! 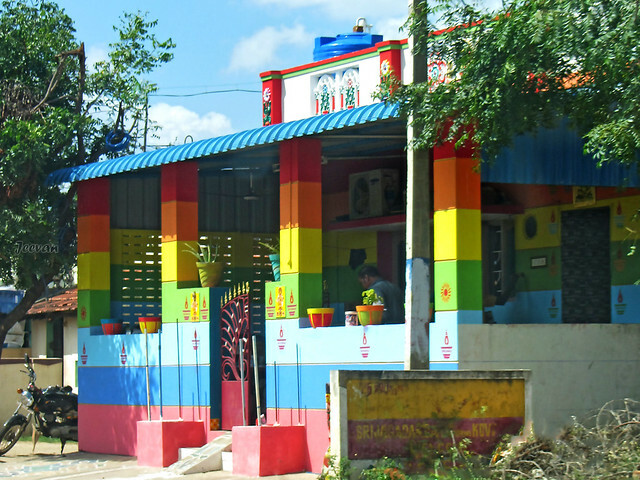 I like this colorful building, it looks so cheerful. Your colours are not available in any site.